If you have more than a few days to spend in Rome, it is worth it to venture beyond the main sights and try off-the-beaten track itineraries. 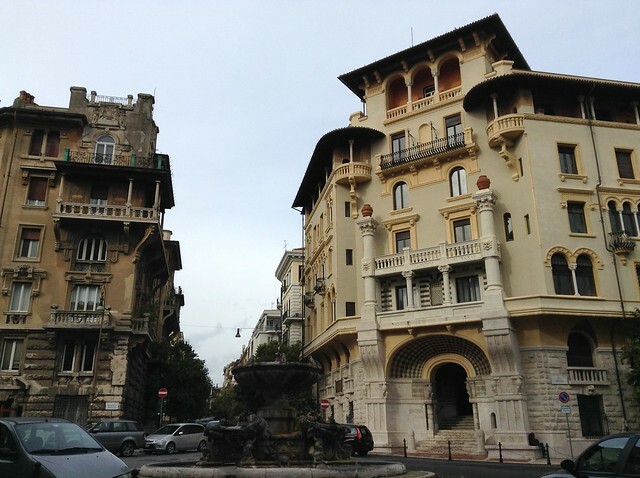 One itinerary that I particularly like is around the areas called quartiere Coppede’ and quartiere Trieste (‘quartiere means ‘area’), reasonably well known by the locals but not by mass tourism. These two adjacent residential areas are just outside the historic centre of Rome and can be easily reached from there by bus or tram. 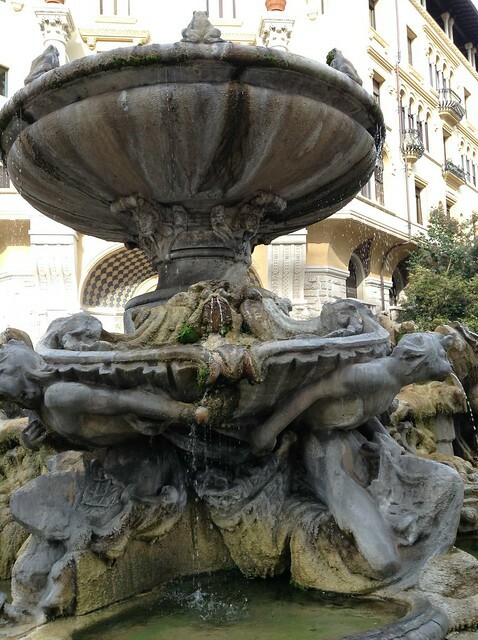 They are tranquil, leafy areas, very safe and they host some lovely parks and some impressive buildings representative of a special interpretation of the rococo style otherwise unknown in Rome. Interested in unusual architecture? 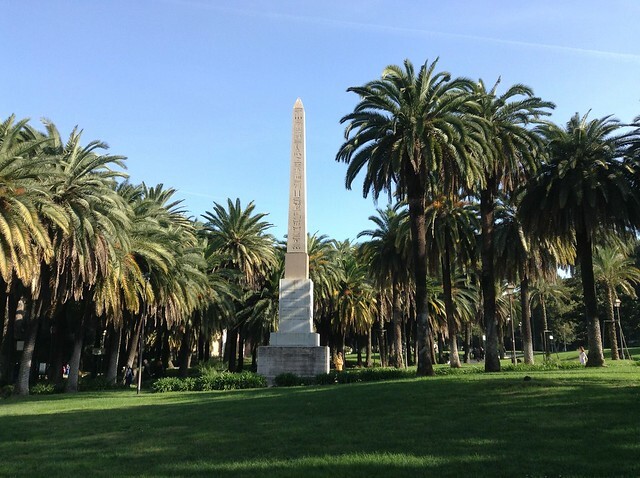 Check also our articles about Rome’s Pyramid and the adjacent protestant cemetery. This itinerary around the Coppede’ district is short (you can walk start to finish in less than half an hour) but I suggest you spend a morning in the area, exploring around the main landmarks I mention below. I usually start this itinerary in Piazza Buenos Aires (Romans often call it ‘Piazza Quadrata’ should you need to ask for directions) which you can reach by tram (number 19 and number 3) and bus (numbers 63, 86, 92, 630). 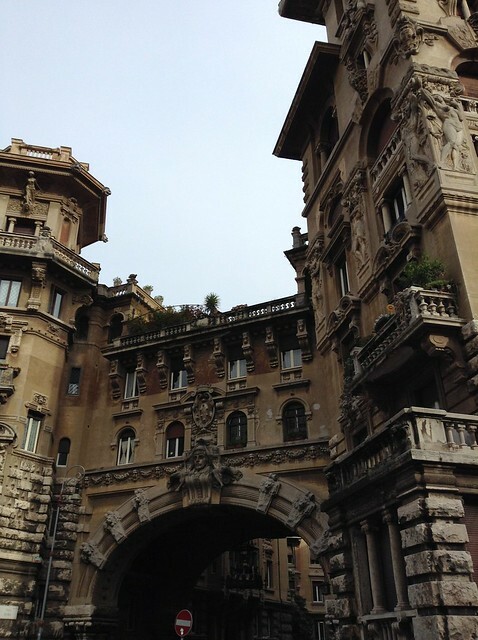 From there you will be just footsteps away from Via Tagliamento and the impressive arch that marks the entrance to quartiere coppedè rome, a very peculiar part of Rome that is worlds away from what you may have seen in the city centre. The area is made by a few streets, and it is named after its creator, architect Gino Coppede’ who built it between 1915 and 1927, the year of his death. It was commission by the Cerruti and Becchi families, who also financed it, and it was finished by a colleague of Coppede’, Paolo Emilio Andre’, who completed its construction. Coppede’ seems to have loved elaborate and unusual decorations and was not afraid of juxtaposing unexpected elements or of over-complicating his design. He was requested by the urban commission to include some architectural reference to the ancient Roman buildings, hence the big archway, but he was influenced by very many different styles and created whimsical buildings where classical architecture is mixed with influences coming from baroque, medieval, art nouveau and rococo’ style. In the Coppede district, the main theme of the decoration is nature (leaves, frogs, spiders just to name a few) but each building has its individual traits and no one house is the same as the other. Some have towers, some have corners and patios and balconies, some are small and some are huge, but they all carry the signs of his vision. 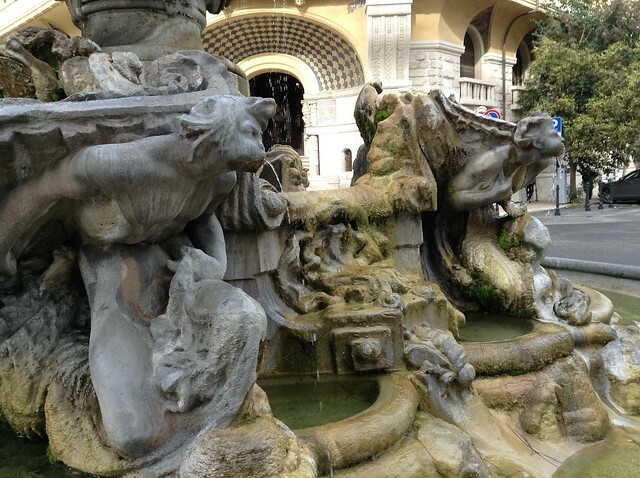 The best way to see all of them is to walk under the archway and head towards piazza Mincio, the little square you will see just ahead of you, whose centre is occupied by an elaborate fountain. The most famous of all is the so-called ‘Fairy House’ which overlooks the piazza and invariably brings the visitors to wonder about its inhabitants! From Piazza Mincio, walk down Via Brenta and you will see the Impressive Via Olona (the private street on your left, gated). You might also want to take note of the building in front of it, which is now a secondary school. Piazza Mincio and Via Brenta are the heart of quartiere Coppede’ but if you keep walking towards corso Trieste you will find some more noticeable buildings, mostly occupied by embassies, cultural institutes or, occasionally, private families. Once you get to Corso Trieste, the whimsical quartiere Coppede’ finishes and leaves space to a much less elaborate area, the quartiere Trieste proper. The first thing you will probably notice here is a big institutional building, a squared, creamy building which hosts a secondary school. This school is called ‘Giulio Cesare’ and was built in the style that was typical of the years of fascism. Did you notice the secondary school in front of via Olona? Well, this one was build only about a decade later and how different they are! The streets at the back of it and all the way up to Villa Paganini are the real gem of this area and this is where our itinerary continues. If you come from visiting the city centre, the main element that will catch you attention here is how much smaller the buildings and the roads are. 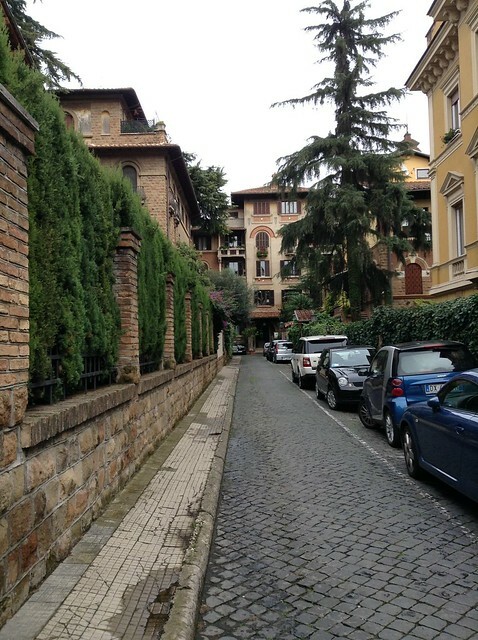 Instead of the big, historical palazzi, this area has a very typical Rome kind of built: i villini. 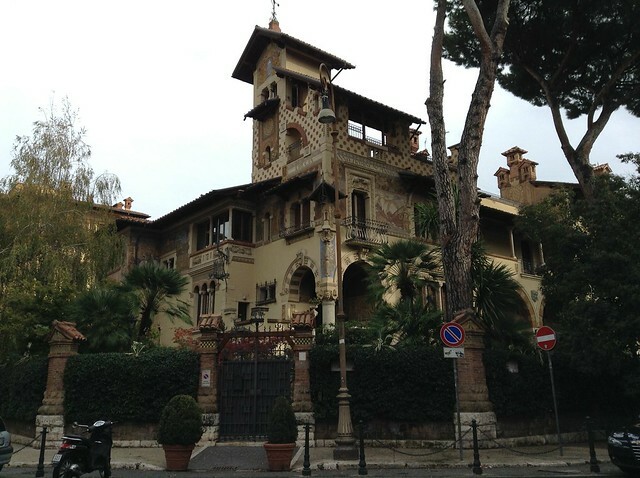 I villini are small family homes generally surrounded by small front and back gardens. They are usually 3 or 4 story high and they were originally owned by individual families from which they often took their name. Now they are often divided up into apartments, usually with one family occupying one story of the building, or sometimes hosting different generations of the same family, one per floor. They were built during the first 3 decades on the 20th century and over the years they very much maintained their look and charm. Some of them are very ‘proper’ and some other have a bit more of what I would call a bohemian charm (see below), and they are all equally stunning (and pricey, should you decide they are a perfect Roman heaven for you!). Villini can be found everywhere in this area and once you are at the back of the school I believe that the very best way to discover this area is to wander around and get lost among the small streets, using Piazza Caprera as your main landmark. The square itself is lovely and it also hosts a small café which is pricey but a nice stop to sit and watch life pass by (try avoid to be there at lunchtime if you can, as all the school kids flood the place and the whole square become noisy and crowded). After a stop here, you can then take on the last part of you walk and head up Via degli Appennini and Via delle isole to reach Villa Paganini, a lovely small park hosting a small playground, a small pond and a primary school. From here you can finish your walk visiting the much bigger and impressive Villa Torlonia, just on the other side of Via Nomentana. The villa is definitely worth a visit: it’s a lovely park, it has some impressive buildings now hosting museums of various kinds and it is also perfect if you’re travelling with kids as it hosts a small playground and a children museum. The villa also has a coffee shop where you can have a drink or even lunch but please be warned: the place is lovely but the service often lets it down! 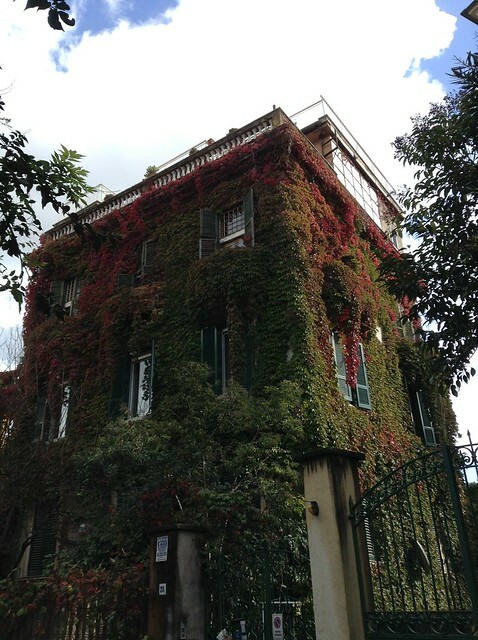 The café is just beside the side entrance to the Villa, which you can also use as a quick exit to go back to the tram line that you can catch on Vale Regina Margherita (about 3 stops away from Piazza Buenos Aires, where the itinerary started).